Every campaign has a delivery report, which contains detailed information about the delivery status. The report data starts being collected immediately after the campaign’s launch, and it can be changed for the next 48 hours. This amount of time is required to repeat sending. You can find this information in your personal account ( «Campaigns → Delivery reports» ). That page stores all delivery reports about SMS and email campaigns. It is a useful and simple tool that helps you to filter reports according to their type, status, category, contact lists and date. Waits schedule Campaign waits for its order to be sent. This index shows a total number of contacts in the campaign. It is taken as 100% by the statistics. A certain number of email addresses are not available at the delivery moment and the system keeps trying to deliver messages for the next 48 hours. The total number of contacts who has received this letter. It might be less than the number of sent messages. You always can get information about the undelivered emails as well as the reasons why. Just click the “not delivered” link. Here you can see two numbers. The first one shows the number of unique contacts that have opened your letter. It also includes such factors as clicks on links and unsubscribing, because it means that the letter was read. The second one at the bottom shows how many times the letter was opened. Usually this number is greater than the first one, because some people can read your letter several times. Index of read letters shows numbers a bit less than they actually are. Email clients commonly use different types of protection and according to them the images in your letters can be hidden by default. In our system the mail tracking is realized by adding a small picture in every letter. And if this image is not downloaded, tracking cannot be provided. Therefore, we recommend that you not rely on an absolute number of reads and use them as a relative measure for comparing different campaigns. Here, you can see two numbers. The first one shows the number of unique contacts that have visited at least one link in your letter (including the unsubscribe link). The second one shows how many times the links were visited, but without including the unsubscribe link. Each click is tracked even if there were several clicks on the same link by one user. Press the second index and get a detailed report about visited links. Number of recipients that have unsubscribed. The number of recipients who received the message but clicked the “SPAM” button in the email client or wrote a spam complaint. The number can be understated, and the real quantity of complaints may be greater. To get information about undelivered emails just click the “not delivered” link. Recipient’s server has responded that the email doesn’t exist or it is disabled due to long disuse. The system will automatically provide an additional check of the address existence, but some domains (like hotmail.com) decline such verification, and email contact will be immediately marked as unavailable. Messages are temporarily rejected by the recipient’s server, because the mailbox is full and there is no space for new messages. Recipient’s email server has responded that the letter is considered as spam and it has been rejected. The first attempt to send the letter was unsuccessful. The recipient’s mail server might be offline, or the campaign is being “Greylisted“. The system attempts to deliver letters, and the status ‘temporarily unreachable’ can be changed. The most common reason for existence of this type of addresses in your list is a typo. You should be very attentive because such email addresses indicate low list quality and may cause low delivery statistics. The second reason might be an error in receiving settings on a recipient’s server side. If the receiving server rejects several letters to different addresses on its domain, it is pointless to try sending letters to them. Receiving server declined to accept a letter without any detailed feedback. Typically, this error can be caused by an incorrect setting of the destination server. When you see available addresses in this list, contact our support team. Each table or chart position is a link. Click it and get a full list of contacts with a particular status. You can perform different actions with these contacts. Also, it’s possible to download a CSV file for further local processing. 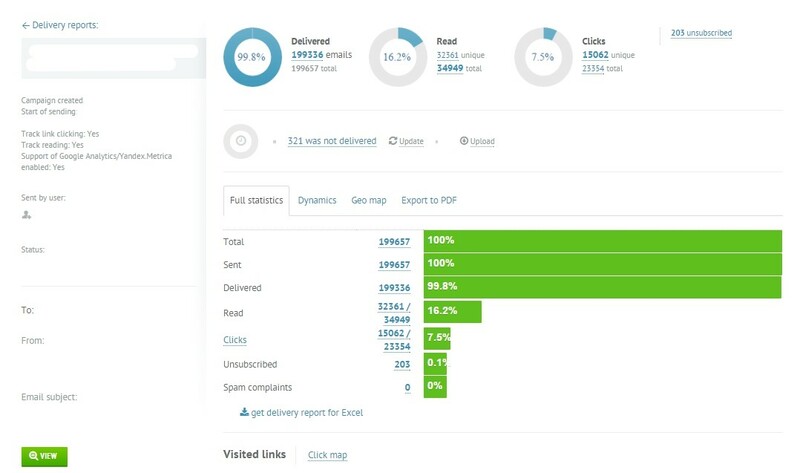 Use the “get delivery report for Excel” button to get a CSV file with detailed information about all the contacts in the campaign list and their statuses. The report shows the quantity of delivered messages and the list of contacts that have received the SMS. Go to the Data tab and select text to columns under data tools then select “delimited” and hit “next”. Then select “;” as the delimiter and hit “finish”.